An understanding of the nature and forms of organisation, particularly with reference to industrial societies, is a key area in sociological analysis. 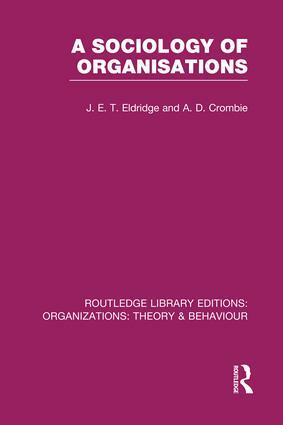 This book discusses and explains what concepts to employ and what analytical procedures to adopt as well as conveying a sense of the theoretical and empirical diversity involved in the study of organisations. why do we classify organisations in particular ways and for what purpose? how can on explore the relationships pertaining to an organisation and its environment? what issues are raised by the existence of many varied and often competing organisations in industrial societies? A Sociology o f Organisations ?